Cytopoint and Apoquel give veterinarians “much needed flexibility,” one practitioner says. Cytopoint is a ready-to-use, sterile liquid injectable. Cytopoint, which was licensed in 2016 for use in canine atopic dermatitis cases, is now approved for the treatment of allergic dermatitis. The expanded indication, announced Sept. 14, gives manufacturer Zoetis Inc. two leading treatments for allergic and atopic dermatitis in dogs. Cytopoint, a monoclonal antibody (mAb) therapy, is injected every four to eight weeks, while Apoquel (oclacitinib tablet) is an itch controller formulated to begin working within four hours. 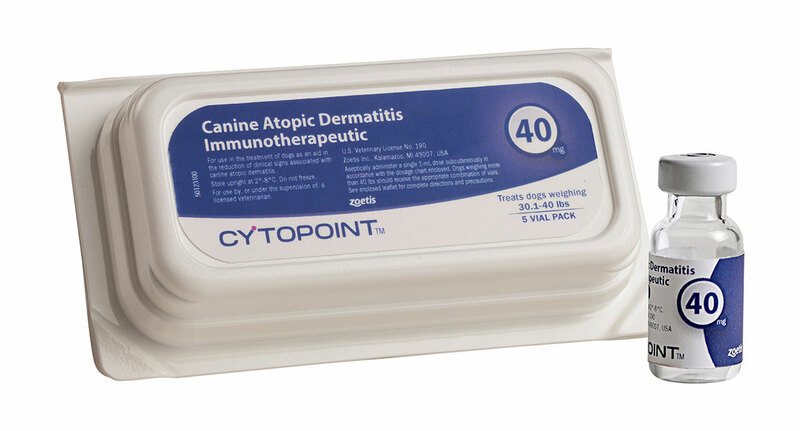 Cytopoint works within a day of administration by targeting and neutralizing cytokine interleukin-31 (IL-31), a key cytokine involved in triggering the itch associated with canine atopic dermatitis and allergic dermatitis, Zoetis stated.